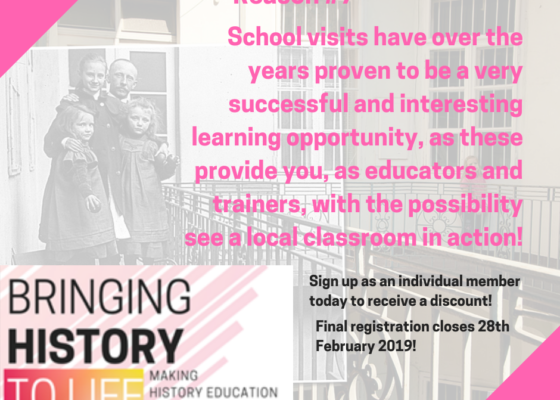 It is safe to assume that history educators like learning history and want to know more. 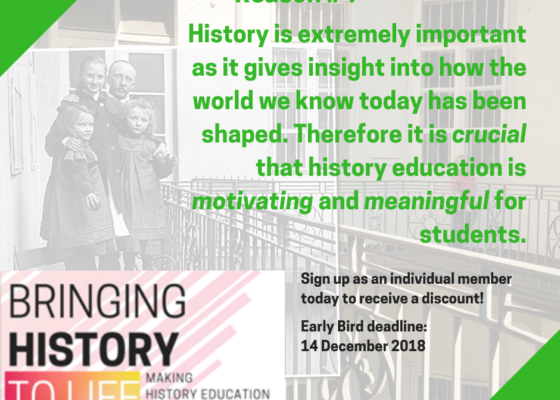 As a result, they develop a deep historical knowledge, which helps them to make meaningful connections, see new information in its historical context and ask questions to guide research and reading. Students of history do not necessarily have these advantages, and also did not always choose to learn history. 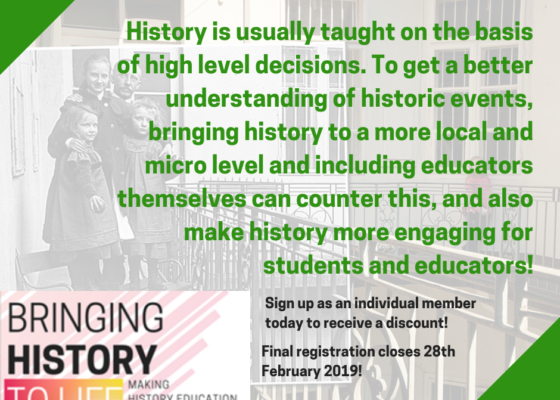 This leads to one of the key challenges for history educators: How to interest all students in learning history? How to bring history to life? Want to learn more? 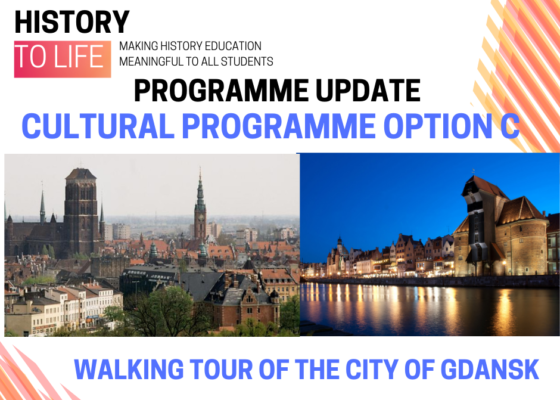 Come to the 26th EUROCLIO Annual Conference in Gdańsk, Poland, from 4-7 April 2019! 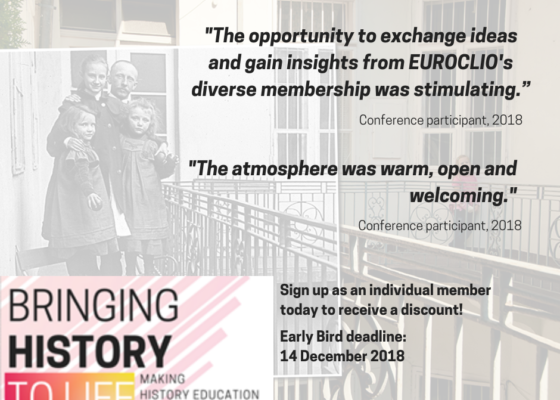 If you don't want to miss this opportunity, become a EUROCLIO member to receive a special discount on the conference fee. 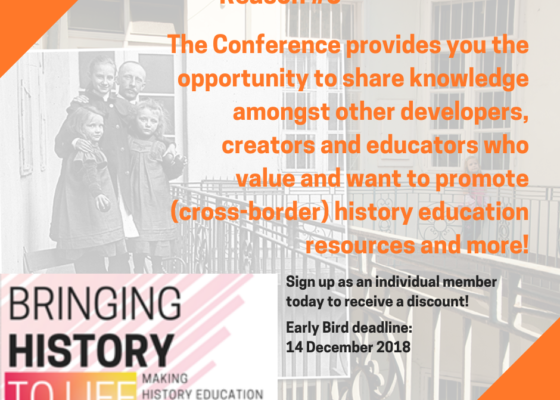 Feel free to read more about the background and theme of the Conference here. 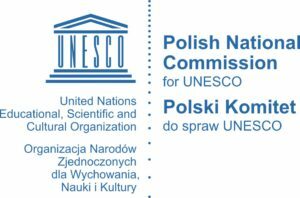 Discover the Cultural Programme of the Conference and our Workshops Offer!! The programme of this year's Annual Conference is gradually taking shape. Some elements, however, are fixed EUROCLIO Conference traditions that return every year and this week's update is definitely one of those! 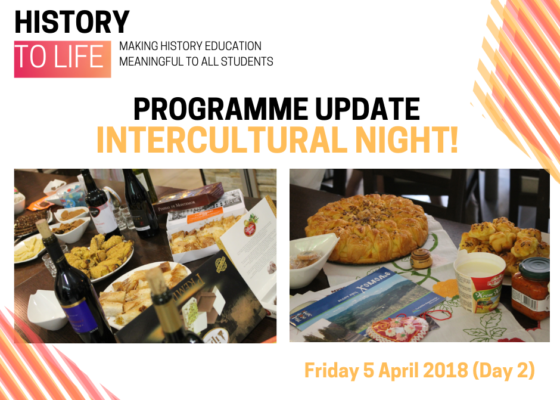 The Intercultural Night is a fun evening event where every Conference member brings to the dinner an item of food or drink specific to their country for all other participants to try and enjoy! 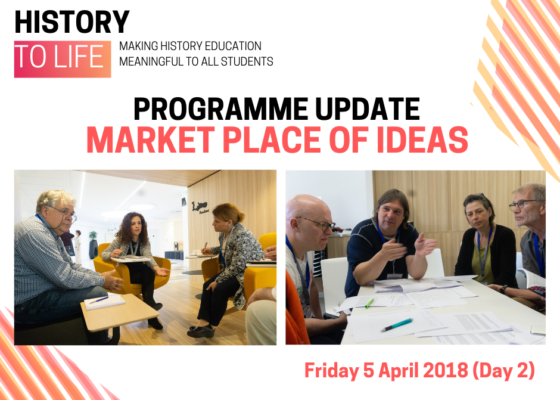 The Market Place of Ideas is a new and exciting addition to the EUROCLIO Annual Conference programme. During this session, you will be able to hear from other educators who they are and what they do. Most importantly, this will be a chance for you to present yourself and your work. We hope this will be a session of exchange, learning and inspiration for all participants. This year’s Annual Conference will include a research poster/project fair during the Marketplace of Ideas. 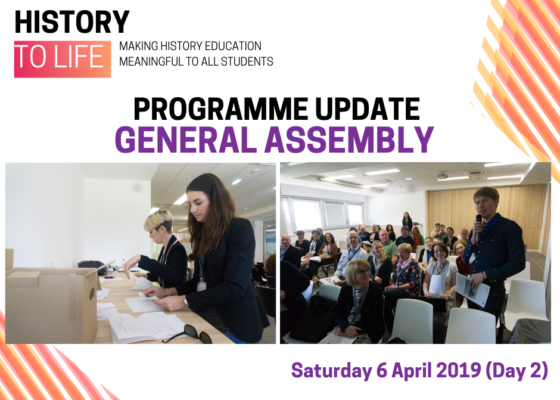 Conference participants will be able to walk around and explore, reading posters and pamphlets contributed by educators like yourselves which will hopefully lead to some great conversations and networking opportunities. Posters can display research projects linked to History and Citizenship education that you have already completed, that are in progress or research ideas that you are perhaps seeking people to collaborate with in the future. It would be wonderful to have as many people contributing to this as possible. 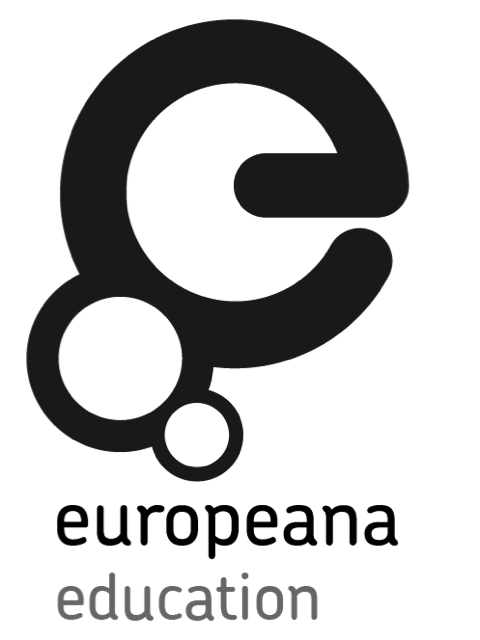 Whether you are able to attend the conference or not, please let us know if you would be interested in contributing a research poster or pamphlet to share with the EUROCLIO community by emailing alice@euroclio.eu. Feel free to pass on this information to anyone in your research communities that you believe may be interested in contributing! 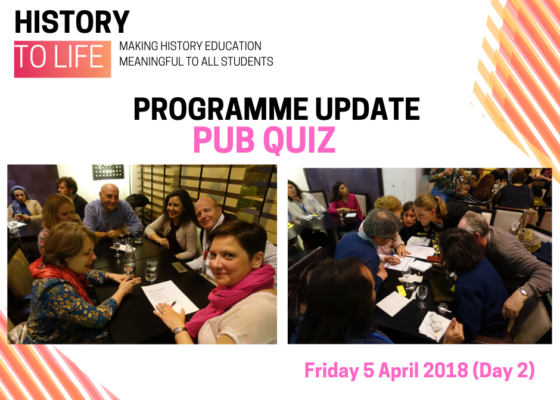 The Pub Quiz is another element of the Annual Conference programme that has become a real EUROCLIO tradition. Coming together after a packed day of Conference proceedings, it is a lovely opportunity to socialise and relax - although your brain should certainly be put to the test! The questions posed are infamously challenging but also very fun. After many fantastic applications, a number of the many workshops have been confirmed, updating our programme with new and inspiring content! 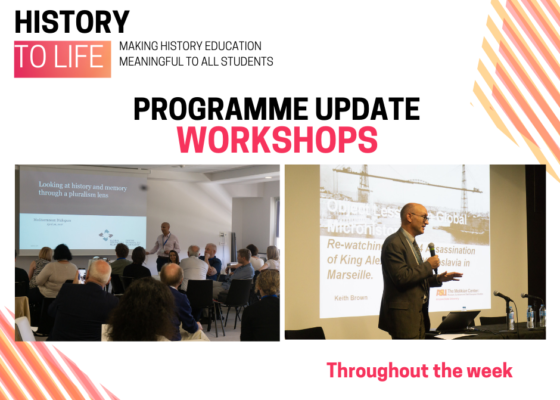 These interactive workshops showcase innovative methodologies and pedagogical approaches that can really bring history to life! More workshops will be announced in the new year too. More information about the workshops can be found by clicking on the Workshops tab at the top of this page on the right. 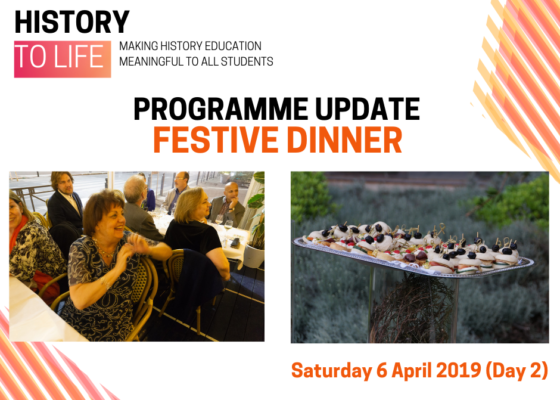 Incorporated into the programme are many opportunities to dine together, but one of the highlights is the Festive Dinner that takes place on the final evening of the Conference. Expect a great opportunity to reflect pn the fruits of the Conference so far and lots of delicious local food! An important part of every Annual Conference is the General Assembly. This is the time when EUROCLIO members are able to vote in the new EUROCLIO board for the coming year. It really is when the democratic nature of our association can be seen in action! There are three different on-site learning activities you can take part in during the Conference. There are two sessions throughout the Conference on different days, meaning you can take part in 2 of the 3 visits. Places are limited though, and you will be asked to sign up for these closer to the time. memory of the Solidarity movement alive, and to inspire new initiatives with a universal, and peaceful, dimension. 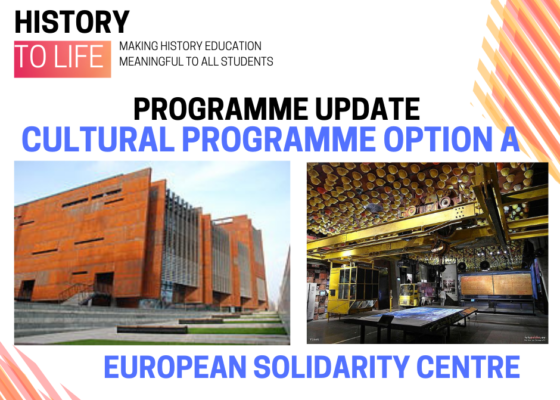 Its permanent exhibition shows the history, events, and impact of the Solidarity movement in seven thematic rooms, set in chronological order from “The birth of Solidarność” to “A culture of peaceful change”. Visitors move their way through the exhibition, while having the opportunity to use archival objects, documents, manuscripts, photographs, video footage, and interactive installations to enrich their experience. This part of the main exhibition of the museum is addressed at children below the age of 12. The exhibition shows a reconstruction of a flat of a Warsaw family during three periods: 5 September 1939 — several days after the outbreak of the Second World War; 15 March 1943 — during the German occupation; and 8 May 1945 — immediately after its end. The changes the visitor perceives of the interior design reflect the changing political, social, and economic situation in Poland during the Second World War. Some elements disappear (radio, certain books, silverware, etc.) and others emerge (iron stove, underground materials, secret hiding place). This reconstructed space gives visitors a first-hand experience idea and can have especially a big impact on children, for they can visualize and grasp the idea of how the space of everyday life could look like for people in Warsaw. 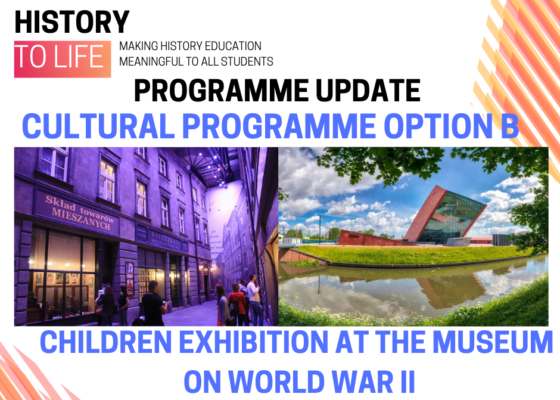 Visiting this exhibitions, children can feel that history is brought to life for them. Like a mini-state all to itself, Gdańsk has a unique feel that sets it apart from the other cities in Poland. Centuries of maritime ebb and flow as a port city; streets of distinctively unPolish architecture influenced by a united nations of wealthy merchants who shaped the city’s past; the to-ing and fro-ing of Danzig/Gdańsk between Teutonic Prussia and Slavic Poland; and the destruction of WWII have all bequeathed this grand old dame a special atmosphere that millions of tourists now come to enjoy. tuned for future programme updates and if this event has made you curious, register today! 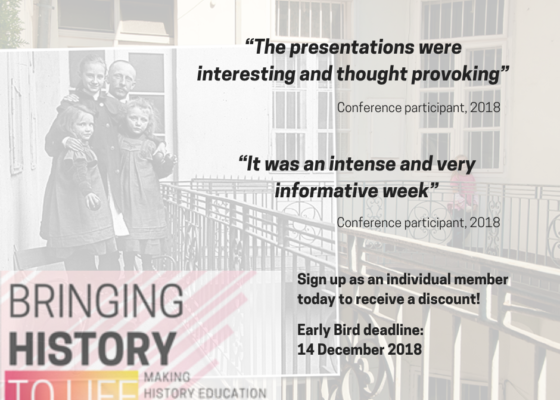 In case you need some more persuading to register for our 2019 Annual Conference, we thought we would provide some quotes from previous Conference participants. 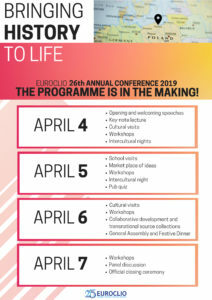 EUROCLIO has been successfully running Annual Conferences since our creation - that you will come away satisfied and inspired is something we strive for each and every year! 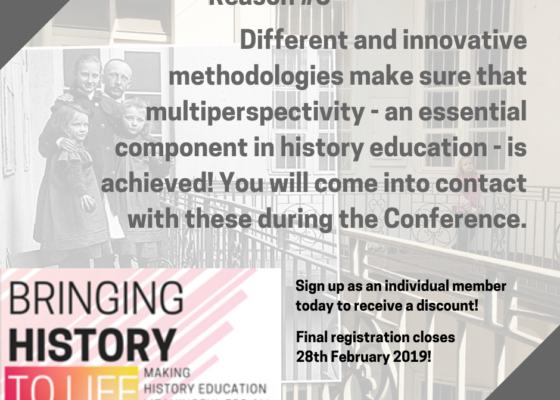 Below read some key reasons why you should attend our fantastic conference happening next April in the hope of persuading the very best group of participants to register. The 26th EUROCLIO Annual Conference is eligible for Erasmus+ KA1 funding. Please refer to the international cooperation department of your school or institution for more information. You will most likely need EUROCLIO's PIC in order to secure the funding. Please note: These forms of support are only applicable for Full Conference Tickets, not single day ones. Only one type of discount can be used. Gdansk), and we would like to suggest participants to use this hotel as our main conference hotel also as far as the accommodation is concerned. 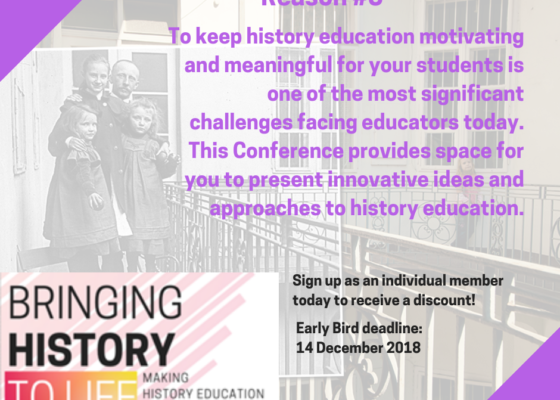 We have negotiated with the hotel a discount code for participants, which will remain active until the 6th of March (one month prior the Annual Conference). Below is the discount code which you can click to go directly to the hotel reservation page and some further considerations. Rooms at special rate are limited - book as soon as possible! Rooms at the discounted rate are limited, so we kindly recommend you to stay tuned and reserve your accommodation at the special price as soon as possible. 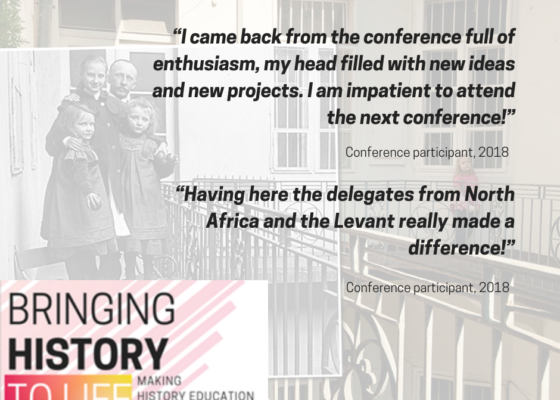 Read about the background of the Conference theme and more about why the conference is happening, and thus also why you should come!